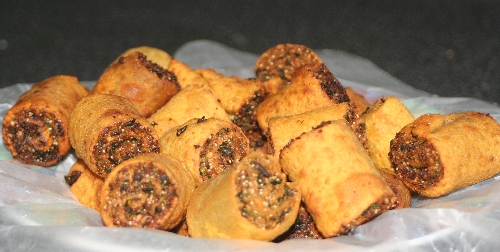 Its very famous snack in Maharashtra, specially in Puna. Must try it! In one bowl take maida, add cumin seeds,turmeric powder, chilly powder,baking soda,salt & oil. Mix it well & add warm water ,knead it & make a dough of it. Roast coconut, peanuts, poppy seeds separately & grind them. Heat a pan with 3 tsp oil. add muster seeds,cumin seeds & let them splutter. now add ginger-garlic paste,turmeric, chilly powder in it.then add ground mixture in it. Now add garam masala, coriender powder, sugar,salt. finally add chopped coriander leaves & remove it from fire.this is a mixture for filling. Divide a dough in to 5-6 parts.roll out each part in to long rectangle on a floured board. Brush the surface of dough with tamarind liquid & apply small amount of filling on each dough & distribute it over dough, then apply 'barik shev' on it & roll it. keep the rolls as tight as possible & seal its ends with a touch of water. Cut each roll in to 1 inch pieces & fry them on medium heat. hi Mrinalini, thanks for ur query. if barik sev are not available to u then don't include it in ur bakarwadi, u can try it without it, still it will gives a good taste & about poppy seeds, we called it 'Khaskhas', very small & white colored seeds, which is an ingredients of Indian spice. thanks amit for trying this recipe, i have two suggestions to make bakarwadi crispy , one add pinch of baking soda while preparing a dough and second one fry them on low heat, it will defiantly turns to crispy.if you try this, let me know the result. Thank you amit, surely try it , you will definatly like it, let me know once you try it. Hoping to see many more nice recipes from you, dear kirti. I used to buy this pallatable stuff quite often, when I was based at Pune. Cheers.